Photo history is a long litany of the lost and found. Reputations rise and fall; trends and tools come and go. A photographer might be the toast of the town for a time, then fall into oblivion a few short years later. William Mortensen, anyone? The opposite of Mortensen might be someone like Mike Disfarmer or Vivian Maier who bursts onto the scene from nowhere and is quickly integrated into the canon. Critical variance seems more the rule than the exception, and the pace of that variance has only increased of late as we plunge further into the end-times. Which brings me to David Freund. Coming of artistic age in the 1970s, his approach blended perfectly with the zeitgeist of the time: 35 mm handheld black and white photography, with a careful eye for serendipitous juxtapositions in the so-called "social landscape" (for want of a better term). As Freund describes the hunt: "I look to dance or jazz: engage the body, have good chops, pay attention, and aim for surprise. Such photography boils down to transmitting data as experience." The best known data transmitter is probably Lee Friedlander. 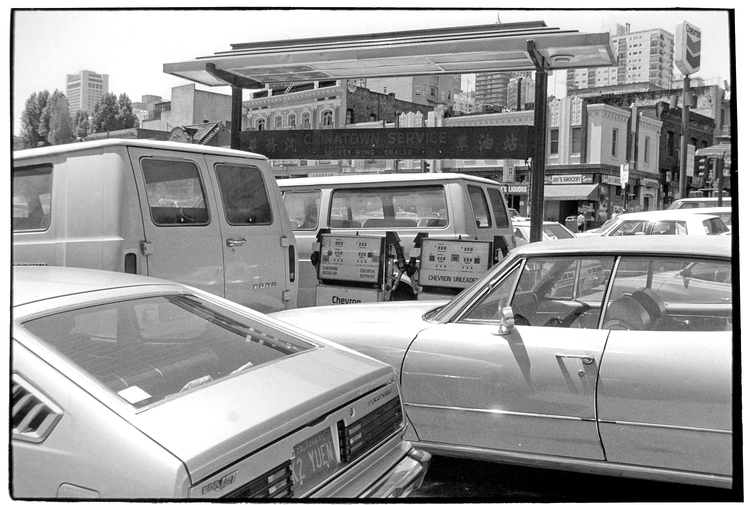 But Freund and several others —including Henry Wessel, Burk Uzzle, Philip Perkis, and Gus Kayafas— found plenty of room in the 1970s to stake out their own territory. Each was a poet of sorts, mining the visuals koans tossed onto roadside shoulders. Put just about any scene in front of them and they'd compose the elements in-camera into a monochrome gem. For a short while in the 1970s —think Jonathan Green's Snapshot— this approach not only flourished but became dominant, the style du jour. When Mike Mandel's 1975 baseball card series included several shooters in this vein, he not only cemented their individual reputations, but the entire approach. A Leica loaded with Tri-X ruled the world! Well, times change. Forty years later these shooters have mostly fallen off the map, and almost taken David Freund with them. Since the 1970s his work had become gradually harder to find. When I tried to research his work a few years ago the trail was faint indeed. There was not much in print or online, just a few grainy portfolios in old camera journals. A 2007 retrospective at Ramapo College (where he teaches) helped put him back in the public eye. 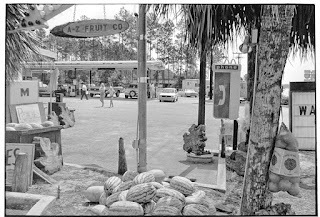 But the big jolt was a chance meeting with Gerhard Steidl during a time Freund was contemplating a gas station project of photos made in the 1970s. As Freund describes it to me, "I put a page on it in his hand, and he responded. Lightning." It's the type of fairy tale breakthrough that never happens. Yet in Freund's case it did. In 2017, a few years after his chance encounter, Gas Stop was finally published by Steidl in a handsome four-volume set. This project can be viewed in any one of several ways, but one primary characteristic is its sheer profligacy. Any one of the volumes could be a nice monograph on its own. The combination of all four into a slipcased set —574 photos, 720 pages, weighing more than a gallon of gas— is massive indeed, and requires repeat visits to digest fully. Perhaps the colossal scope is a comment on the outsized importance of gas in American culture? Maybe not. In any case I spent about a week with it —longer than I've spent so far at the pump this year— browsing one book roughly every other day. By the end I hadn't yet grown tired of the photos. I was, well, pumped. 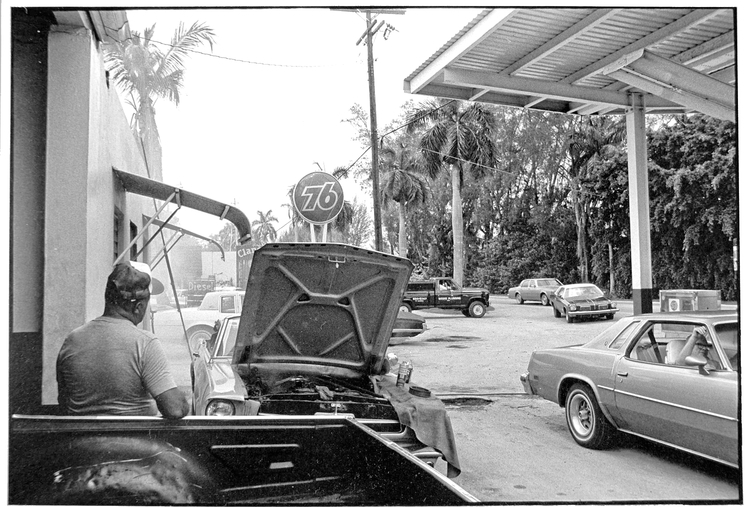 Freund made his gas stop photos between 1978-1981 traveling through forty-seven states. Each volume tackles one region of America. 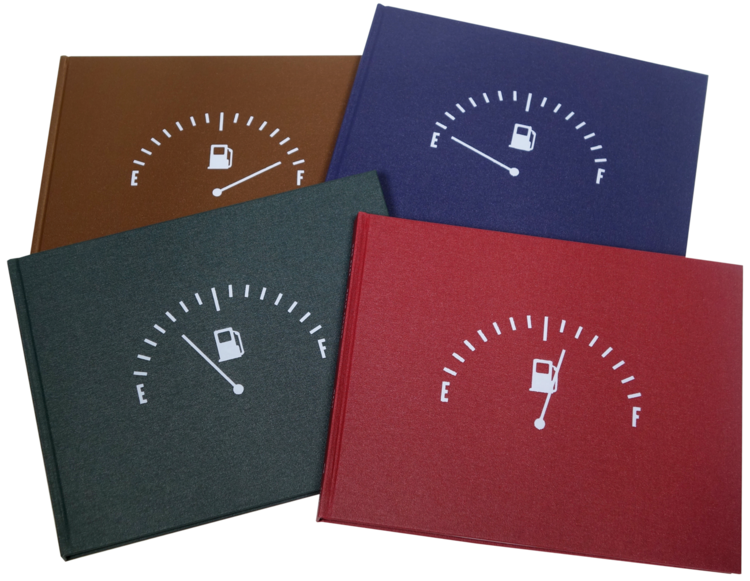 A cover graphic on each book charts the course of a gas needle as it moves from empty (south) quarter tank (east) to two thirds (west) to full (midwest). It's probably reading too much into the graphics to interpret them as a comment on regional favoritism. But let's do it anyway. My least favorite region politically speaking, the south, is dead last on the gas gauge. Coincidence? Who knows. But the south makes up for its political slant with a richness of vernacular material no other region can match. In the 70s-80s photo ops grew like kudzu down there. Maybe's it's still like that. Within each book the photographic approach is similar. Most of the gas stations are in rural or suburban settings which tend to homogenize location. More importantly, Freund's keen vision dominates any regional specificity, so pinpointing locations is tricky without looking at the captions. I spent some time focused on this aspect, to see if I could identify a region from its gas stations alone. It seemed like it should've been easier than it was. But let's take a step back. Gas stations? Why gas stations? Gasoline was on everyone's mind in the 1970s. This was shortly after the OPEC crisis. Gas was king. Gas ran the world, perhaps more so than today. 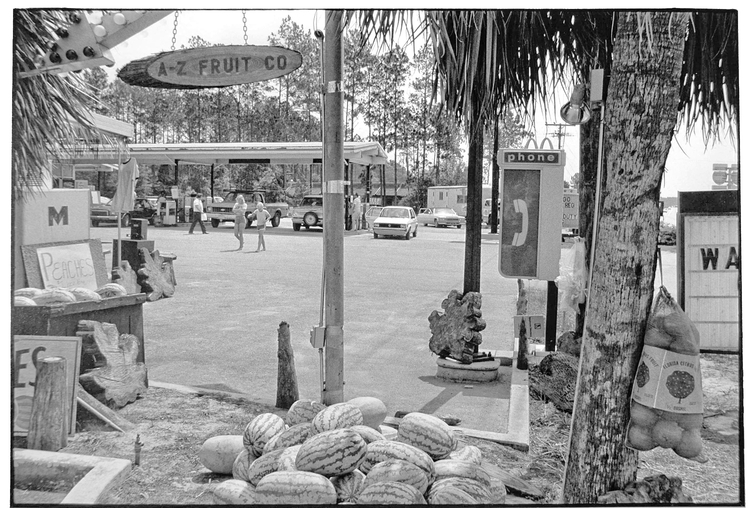 But even apart from that time period filling stations have been a locus for all sorts of photos and projects, from Frank to Shore to Soth to Ulrich to David Campany. So Freund wasn't the first to hit on them as a subject. But his effort is probably the most sustained and prodigious. To hear Freund describe his project's epiphany, "I became aware of gas stations as a locus for many elements that characterize America." Here are some American characteristics: advertising, chintz, autos, grit, wires. His photographs depict all these things and more but perhaps what identifies them as American is the generous sense of open space. The photos are as focused on the surroundings as the subject. Foreground and background contribute equally, both combining in that inimitable photographic way that typified the monochromatic 70s. Perhaps their most American trait is the sense of possibility left in the frame. Most of the images fall off along the top or side into an open patch of sky, vegetation, or new development. They exude a sense of optimism, as if one could wander into them and never hit the wall. 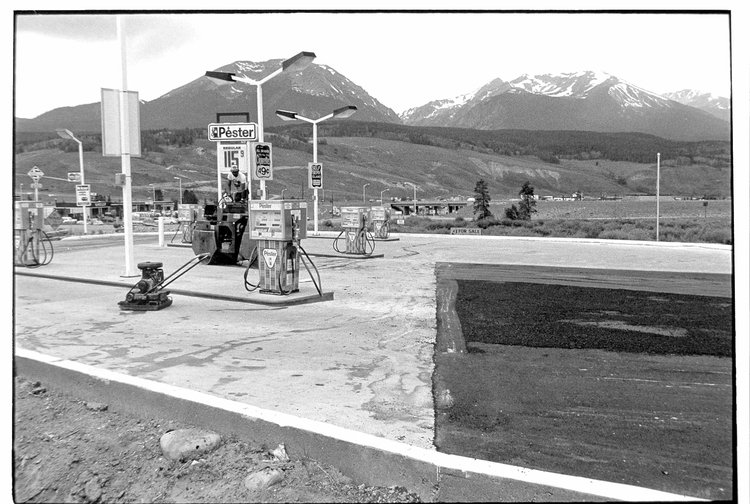 Looking at Freund's photos peak oil, end-times, and other concerns fade like carrier marks into the margin. "... And then it's funny, I forget what year when Robert Frank's book came out. He was working pretty much around that time, '55 or whenever it was. And there were photographs in there, particularly that gas station photograph, that I learned an immense amount from. I mean, I hope I learned. At least, I feel very responsible . . . [tape unclear]. What you're responding to, is it the quality of the intelligence that states the problem? GW: Yeah, I don't give a rap about gasoline stations. . . . "
Given the dominance of the trope in the 1970s and 80s, what's remarkable is not how many reputations have survived this poetic meme, but how few. In the UK every photography dept and art school were turning out Tri-X and Leica wielding acolytes, and I assume the same applied in Europe and the US. This looks like an especially persistent and compelling example of the type, that for the intervention of Steldl in a suitably fairy tale manner, would have remained as photographic marginalia. One wonders how much else there is to be discovered between the yellowing glassine folders of old men who've mined their seam to exhaustion and moved on? Ordered. Steidl habit don't come cheap.